Orion-Mad Pictures’ Eid-Diwali release Kyon Ki sees Priyadarshan, the name responsible for cleverly crafted films like Gardish, Viraasat and Muskuraahat, return to a genre that has always had him at his creative best. Having been primarily involved with comedy capers over the past few years, not only does he comes back to serious and sensitive cinema with Kyon Ki, he teams up with Salman Khan for the first time. What’s more, he even manages to pair Khan with Kareena Kapoor for the first time ever. While serious cinema is no alien territory for Priyan, it is something that Salman hasn’t explored an awful lot. So with Priyadarshan’s name, a serious love story, Salman’s return to an intense role after Tere Naam, Salman-Kareena Jodi, great music, one could easily say that the makers have a winner up their sleeve… Well, not quite! Kyon Ki comes riding high on expectations… afterall, a Priyadarshan film always comes full of promises and more than often fulfills them as well. Unfortunately, with Kyon Ki, Priyan goes completely wrong as a filmmaker – This surely comes as a surprise from someone who has always been acknowledged for his precise execution and taut subject handling. Right from an inapt screenplay to tactless direction, Kyon Ki comes across as just another Bollywood movie with not much to offer in terms of novelty. With a story like Kyon Ki, that offers little surprises and twists, deft execution was a prime requirement - a requirement that just doesn’t get attended to all barring a couple of sequences. Had Priyan risen above the clichéd and the ordinary, Kyon Ki would have been a totally different viewing experience. But sadly, the 80’s style treatment and unimpressive direction are Kyon Ki’s biggest undoing. So what’s the story like? Well, it’s about Anand Sharma (Khan) who enters a mental institute being run by a strict retired Colonel, Dr, Khurana (Om Puri). Anand’s prankish and playful nature lands him into serious trouble with the colonel who wants to instill some discipline in his rebellious patient. And to make matters worst, Dr. Khurana’s daughter, Dr. Tanvi (Kareena Kapoor) too doesn’t take a liking to the institute’s newest entrant. But hey! Life’s not too bad for our lunatic lead man after all as he finds a well-wisher in Dr. Sunil aka Sunil Bhaiya (Jackie Shroff) and besides, the inmates adore the happy-go-lucky Anand. Dr. Sunil’s insistence and an overnight read through Anand’s gigantic diary (literally!) force a change of heart in Dr. Tanvi, who now is hell-bent on getting Anand back to normal. And just when you think things couldn’t get more predictable, Priyan proves us all wrong, and how? Well, how about a boring flashback? Or if you think that it is still bearable, all it takes Dr. Tanvi to cure our Anand is a sad title song, crazy flashbacks, and a nasty blow on the head. Ah, sadly, some things never change in Bollywood. But hey, hang on; the movie is far from over yet! Dr. Tanvi is yet to fall in love with Anand only to find the evil Dr. Khurana against this match. And that’s not all; an uninspiring special appearance by Sunil Shetty is also on the cards for us. Frankly, the only respite in the story comes in the form of the climax, which is bound to take pretty much everyone by surprise. But it, too, comes up abruptly. Technically, the film is brilliant. Thirru’s cinematography is breathtaking at times and songs have been canned expertly. Make sure to check out music-video style electric shock sequence, it is just awesome. A special mention must be given to the art direction as the mental institute set is high on standards and can easily match the best in Hollywood. Choreography is quite good except for the Jhatka Maare song – what’s up with all the inmates breaking into a synchronized dance routine? The only culprit is the editing as the scissors could have been used more effectively especially with the flashback which seems almost never-ending. All in all, a Priyadarshan film has never been so technically brilliant. Sanjay Chhel’s dialogues are plain average and one misses his sharp wit as the comic lines hardly evoke laughter. Screenplay is also a major let down and pretty much handicaps Priyan’s directorial abilities. Himesh Rehsammiya’s music is a major asset. Almost all the songs are nice and make for a great soundtrack. However, barring a couple of songs, one does feel that the songs have been forced and at times, they just slow the pace of an already flaky script. Having said that, all the songs have been ably picturized. Priyan may have fallen short of expectations with the execution of the script, but one thing that he yet again succeeds with is his extraction of amazing performances from the principal cast. 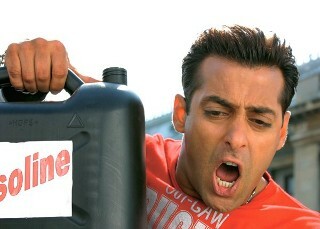 Salman Khan is arguably Bollywood’s most underrated actor. While his star-status can never be questioned, his acting ability has always come under fire from critics and viewers alike. I, on the other hand have always believed otherwise, as Salman’s ability to casually walk through complex roles and still coming up with believable performances is something that not even the best in the business have. We saw a few sparks of such brilliance in Veergati, Hum Aapke Hain Kaun, Baaghi, Hum Dil De Chuke Sanam and more recently, Tere Naam. With Kyon Ki too, Salman shows signs of being a potentially great actor; an actor who is finally getting his due from an industry where a star’s acting credentials are often weighed in terms of the award trophies he takes home every year. While I would still rate Tere Naamas Salman’s best work till date, Kyon Ki definitely features as one of his best performances. Looking young and charming, his dialogue delivery, especially in the music sequence, is flawless. While he is at extreme ease with light sequences, he is equally faultless when it comes to expressing emotions. Watch out for his expressions in the final sequence. The drop of the tear coupled with his perfect expression is bound to unsettle even the strongest of hearts. 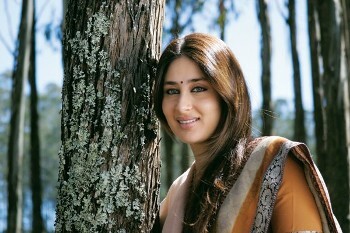 Kareena Kapoor, too, turns in a mature performance. Looking every bit of the part, she leaves a hammer strong impact even when sharing the screen with seasoned stars like Salman and Jackie. We would surely like to see such stuff from you more often Ms. Kapoor! Rimmi Sen (credited just as Rimmi) doesn’t have much to do except for looking nice; and she does that quite well. Om Puri is extremely loud but so are at least half a dozen characters in any Priyan film. Still he looks the part and does an able job. Sunil Shetty wasn’t even required to be there in an inconsequential role. The supporting cast just passes muster. Without doubt, the best performance of the movie comes from Jackie Shroff. As Dr. Sunil, Jackie is simply brilliant. It’s been a while since he did something significant and Kyon Ki comes as a pleasant surprise. His chemistry with Salman is heartwarming and he makes use of every bit of the opportunity thrown at him. The seasoned performer he is known to be, Jackie does a marvelous job especially in the confrontation scene with Om Puri as well as the climax. It’s good to see have you back Mr. Shroff! At the end of it all, Kyon Ki leaves the viewer with mixed feelings. As one walks out of the theatre, one feels disappointed at the overall expectations not being met but at the same time, the unsettling climax and powerhouse performances leave a strong impact. While one might argue that the climax can damage the film’s Box Office prospects, it is this very climax that takes the movie to an all time high. Kyon Ki is not a bad movie, it just isn’t as good a movie as one would expect from Priyadarshan. Considering that it comes from a master craftsman like Priyan, Kyon Ki just doesn’t impress. At the box office, it faces stiff competition from Garam Masala and Shaadi No.1, but in the long run, could make money for its makers thanks to Salman’s box office pull and no major new releases over the coming weeks. As the collections have already started picking up for the film after a lame start, don’t be surprised if it becomes a profitable venture for all involved, afterall, Kyon Ki…. it’s Salman!